Thaw out in the heated outdoor pool and hot tub, then head back inside for a fireside seat. Once Team Cleanup has worked its after-dinner magic, break out the cards for Euchre. Or if it's still ski season, keep those layers on and step outside long enough for a hot-drink toast to a great day on the slopes. Hit the Champagne Powder at Steamboat Ski Resort, a quick 16 minute walk from the resort. A swim in the heated outdoor pool is the perfect post-ski, pre-dinner activity. Escape the cold in the outdoor hot tub, the perfect way to relax after a long day. Get your snacks ready and see who's up for a hike. Emerald Mountain is 11 minutes drive from the resort and Spring Creek Trail is 8 minutes drive away. Rollingstone Ranch Golf Course is a 5 minute drive from the resort. Grab your clubs and go. Make yourself at home right at the base of the Steamboat ski area at Canyon Creek in the exclusive EagleRidge neighborhood. It’s an easy 200-yard walk to the gondola, which means you have plenty of time for seconds on pancakes and sausage. Once breakfast is cleared and everyone’s layered up, do one last sunscreen and matching-glove check and make your way to the ski valet to retrieve your gear. Semi-long line at the gondola? Don’t worry, it moves quickly. Or you can take the Christie chair for a few warm-up runs. (Preview works well for the beginners in your crew.) Return exhausted but triumphant from your adventures on the slopes and head for the heated outdoor pool and hot tub. Once you’re fully thawed, dry off and head inside. 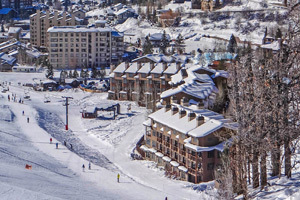 The clubhouse offers weekly ski season Managers’ Receptions with complimentary beverages and appetizers. (Pro tip: there’s an espresso and cappuccino bar there too.) Later, catch the seasonal shuttle into downtown Steamboat for Beau Jo’s Pizza, or if you’re all dragging a little after that first full day, call for takeout from Soda Creek or Blue Sage. Need to stock up on a few extra groceries? Follow the walking trail along Burgess Creek to Wild Plum Market. Sprawl out in your spacious two- to four-bedroom condo, gathering around the table each night for home-cooked dinners and rowdy board games. Nearly every residence treats you to a full or partial mountain view or a peek at the pool – pull those curtains open and enjoy. Full granite-counter kitchens are well equipped, so you can flaunt your skills in that department and be the hero come time to devour that pasta or chili. The gas fireplace keeps the living spaces cozy, just the right vibe after spending an entire day in the snow. Wash gaiters and ski socks or toss wet gloves in the dryer so everything’s ready for the next day’s adventures. The large balcony is sheer bliss in the summer months – and who knows – you may get a surprise “warm enough” day to enjoy it during ski season as well. A full mountain range, Steamboat is the real deal, encompassing Mount Werner, Christie Peak, Pioneer Ridge, and Sunshine, Thunderhead and Storm Peaks (all weather-inspired names – coincidence?). Winter is jam-packed with snow-centric activities, from skiing/snowboarding to snowmobile tours through the gorgeous Routt National Forest along the Continental Divide. Never tried snowshoeing? Strap some on and join the Steamboat Ambassadors for a free tour at the top of the gondola. Or try the mile-long Moonlit Snowshoe Tour with a hearty dinner at Hazie’s on the mountain. Summer is equally lively with river sports like fly fishing and rafting, plus hiking and biking on the trails. Fly down the 2,400-foot Howler Alpine Slide or see if the rodeo’s in town. Fill your evenings with horse-drawn wagon rides and dinner at a mountainside lodge. Or hit the Saturday night Movies on the Mountain, right at the base. Old Town Hot Springs is open all year, and well worth a visit, complete with eight hot, natural mineral water pools, two 230-foot twisty water slides, lap pools and a fitness center. - Front desk is open 8:00 AM-5:00 PM daily. Guests that are planning to arrive after hours can pick up keys from a lockbox located outside the front desk. For more information please contact the property using information on the booking confirmation.